No book has had more influence on the liturgy than the Psalms. The prayer-book is an echo of the T’hillim. Seventy-four of the 150 Psalms are incorporated bodily in the Siddur. Some services consist largely or entirely of Psalms. Jewish prayer-language reflects the Psalms in mood and style. According to tradition, David wrote the Psalms, though only 73 are ascribed to him by name; but irrespective of the extent of his authorship, David is regarded by the Jewish people as the great mouthpiece of the heights and depths of human emotion. Through his Psalms, we tell a listening God of our penitence or praise, our delight or despair. The morning prayers begin with p’sukei d’zimra, “passages of praise” from the closing chapters of the Book of Psalms. The morning service also contains Psalms 145 and 20, asking God to provide our daily needs, and concludes with a Psalm of the day, reflecting the character of that day. They range from Sunday, the first day of creation, when Psalm 24 declares: “The earth is the Lord’s and the fullness thereof; the world and they that dwell therein”, to the Saturday Sabbath, when Psalm 92 speaks of the messianic age when the world will be at rest and the righteous will prevail. On Rosh Chodesh, the beginning of the month, Psalm 104 is added. This celebrates the works of God, who regularly renews the miracle of creation. 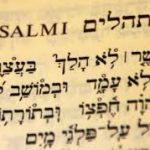 On Friday evening at sunset, the Shabbat service opens with nature Psalms – Psalms 95 to 99 and Psalm 29 – introduced into the liturgy by the mystics of Safed, in the sixteenth century. On Friday as evening fell, they would go out into the open and acclaim the Maker of the universe in the idiom of the Psalmist. Shabbat morning worship contains a lengthier series of passages of praise than that for weekdays. The highlights of the service, particularly the Torah processions, are accompanied by the singing of Psalms. Sabbath afternoons for part of the year see a reading from the Ethics of the Fathers. For the rest of the year the service includes the 15 Psalms of Ascents (Shirei Hama’alot) – Psalms 120 to 134. Tradition says that these were sung in the Temple by the Levite choir, as they ascended the 15 steps leading up to the Court of the Israelites. The joy of Pesach, Shavu’ot and Sukkot is marked by the Hallel Psalms of praise, T’hillim 113 to 118. Hallel is also said on Chanukah and Rosh Chodesh. Each festival has an additional Psalm reflecting the theme of the occasion. On more personal, domestic and private occasions the Psalms are no less important – indeed they assume unique prominence, because the agony and ecstasy in the life of an individual or a family find such an echo and articulation in the words of T’hillim. First is Birkat Hamazon (the Grace after Meals), introduced on ordinary occasions by Psalm 137 and on Sabbaths and days of joy by Psalm 126, with its optimism and hope (“They that sow in tears shall reap in joy”). The prayers before retiring to rest at night; the prayers said on going on a journey; those for a sick person, for an invalid who has recovered, and for a woman after the birth of her child; the prayers said before a burial; the funeral service; the prayers in the house of mourning and those at the consecration of a tombstone; the wedding ceremony, and the ritual at the consecration of a house – all rely heavily on the words and spirit of the Psalms to say what needs to be said. T’hillim, the Hebrew word for Psalms, is colloquially abbreviated to Tillim. The Tillim, according to the pious, open the gates of heaven and secure Divine mercy. In many a Jewish community there is a Chevra T’hillim, a group that meets weekly or even daily to read the whole Book of Psalms. Because the Psalms are essentially a way to show feelings, they have inspired countless musical renderings revealing the heights and depths of emotion. Synagogal composers have enshrined the Hebrew text in musical modes that are sometimes solemn and stately, sometimes joyous and rapturous. The Psalms themselves, and especially the final one, Psalm 150, refer to the instruments which provided musical accompaniment as the Temple choir of Levites sang the words. We are no longer certain of the identity of all these instruments. Nor are we certain of the melodies that were employed in ancient times, though it is possible that some existing chants are based on Temple melody. Hence most of the melodies in use today are of quite recent origin. The Psalms have not only an emotional but an intellectual content. Without suggesting a system of doctrine, they present God as both transcendent and immanent – perhaps a necessary paradox in religion. They see man too as a paradox, with both his greatness and his littleness. They speak of sin and evil, but they also believe that right will finally be vindicated. They show how the righteous person meditates on the law of the Lord. They express the experiences and aspirations of the people of Israel and regard Zion as “the joy of all the earth”. This entry is filed under Articles, Bible/Tanach, Interfaith Issues, Texts.